Character in Pulp Fiction played by Samuel L. Jackson in which he received an Oscar nomination for best Supporting Actor. Though many purport it can be argued he was the Lead Actor. Probably one of the best and most memorable characters Quentin Tarantino has ever written, Jules Winnfield is a man who changes over the progression of the film. Though we originally see him as a fast-talking scary hitman who quotes the bible of all things, we later see another side of the man. He becomes increasingly tired of not only his incompetent partner Vincent Vega, but of his way of life as a hitman. It's only after an unaccounted for member of Brett's posse comes out of the bathroom gunning for the duo, and having survived that he comes to contemplate the bigger issues in life. His very purpose on the earth, now has new meaning and it isn't killing for money. Vincent further complicates things with accidentally shooting Marsellus Wallace's mole, Marvin, in the face. So this is one very interesting day on the job. Not only does he survive bullet fire from a 44. Magnum, but now his partner accidentally kills a guy working with them. After a long time of being pissed off with Vincent for almost causing a scene, and finding refuge at his friends Jimmie Dimmick's pad, they get cleaned up by The Wolf and dump the bloody vehicle at Monster Joe's. But, it's the duo's final choice to go have breakfast at the Hawthorne Grill that leads Jules to start thinking. The robbery Pumpkin and Honey Bunny orchestrate at the Hawthorne Grill, brings Jules' story to a fitting close, as he finally realizes while eating his muffin that life is more than material goods or violence in general. It has been widely regarded that through Jules, Quentin Tarantino is himself saying sorry. The fact that his two lovebirds are almost avatars for his Natural Born Killers/True Romance heroes and they are facing two cleaned up Reservoir Dogs who have literally cleaned up their act. Well, at least one of them, Jules Winnfield. Jules: "That IS a tasty burger!" 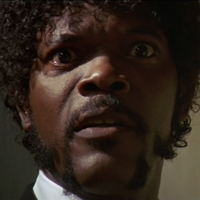 Jules: "Say WHAT one more goddamn time! I dare you! I double dare you motherfucka!!" After stripping their bloody rags, Jules is given a Krazy Kat T-Shirt. Krazy Kat is a popular older comic strip. It's believed Jules name derives from an amalgam of two sports stars, the NBA's Julius Erving aka Dr. J(whose middle name really is Winfield) and the MLBA's Dave Winfield. Jules carries a wallet marked "Bad Mother Fucker", and when he has Pumpkin searching for it, he easily identifies it as such. 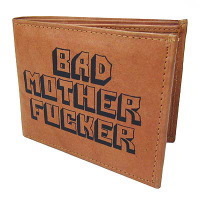 This Pulp Fiction wallet has since become cut. The character may be a homage to a real life acquaintance of Tarantino's named Big Don. On the True Romance Unrated Edition DVD, Tarantino claims that the homage to Big Don appears in a few of his scripts. True Romance was one, Jules may be another. It's important to note that he was also originally responsible for what bacame the infamous Silician scene. This page was last edited on 7 June 2011, at 20:06.